Prized for its red color, this Grecian native is generally found in humus rich, stony limestone soils and lightly shaded areas, but prone to virus and botrytis attacks in the garden. Named for the ancient city of Chalcedon, seed should be sown in an area where undisturbed growth can be maintained, as this species highly resents being moved, and is probably the main reason it is rarely seen in commerce. The addition of lime to the soil of western gardens is a must as in nature it is found on dry limestone hillsides. The variant 'maculatum' was discovered by Constable in 1930. The significant difference from the type are the black spots on this variant. Seed germination is epigeal and is reported to be often delayed and rather erratic. Title photo courtesy of and copyrighted by Thysje Arthur, all rights reserved. Used with permission. Thank you Thysje. 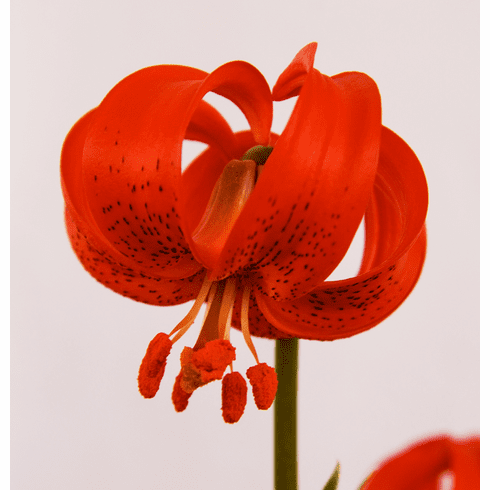 Photo insert copyright Rex Lyes, President, New Zealand Lily Society, all rights reserved. Used with permission. Color difference is probably due to lighting and early vs. later dated digital technology as this species is red.